Grab the bar. Place your pinky on the Knurl (ring) marks of your bar. Hold the bar in the base of your palm with straight wrists and a full grip. Bench Press with your lower back arched. Lie on the bench with a natural arch in your lower back. The same arch your lower back shows when you stand. I should be able to slide my flat hand between the bench and your lower back. Arching your lower back also helps to keep your chest up. Keep your feet about shoulder width apart, with your heels flat on the floor. Bring them back so that you can feel the tightness and tension in your legs and core. When you bench press, drive with your feet, engage the glutes, hamstrings and quads and push this force up through your body into the lift. Having your feet flat on the floor will also help you to stay stable throughout the whole lift. Always keep your body tight and your core engaged throughout the full lift. The bench press is not often programmed into Crossfit workouts. This is surprising in many ways because it is an incredibly effective exercise for building strength and power. These benefits can be transferred into improving lock-out strength, which is highly useful for overhead pressing and olympic weightlifting exercises. If you are interested in bench pressing to improve your lock-out strength, start by assuming a narrower grip. To develop a strong lock-out, you need strong triceps. Not only does a narrower grip take stress away from the shoulders by decreasing shearing force on the joint, but it also increases the load on the triceps by increasing elbow flexion. The ideal position for transference is going to be your jerk grip or overhead pressing grip. This will help strengthen the exact position you use when going overhead. If you’re concerned about shoulder health, the closer you can get your arms to parallel in the starting position, the better. Most Olympic lifters in the ’60s shunned benches. They didn’t want any additional body weight to be laid down on their chests because the pectoral muscles do very little in overhead lifting. They preferred to spend their time doing more overhead work and weighted dips, as well as doing isotonic-isometric contractions in the power rack when isometrics were the craze in the early part of that decade. There was also the general opinion that the bench press tended to tighten up the shoulders, making them less flexible, and flexibility is crucial to success in the Olympic lifts. The standard of strength for many up until the early ’70s were overhead lifts. Then several things happened that changed things dramatically. First, there was the emergence of the sport of powerlifting. Competitive weightlifters who were having difficulty mastering the quick lifts found that they could utilize their strength much more readily by doing less dynamic lifts: bench press, deadlift and back squat. Nearly every pioneer in powerlifting was a former Olympic lifter. Except for a few rare exceptions, these athletes stopped doing overhead presses completely and spent more time improving their benches. The bench press works the deltoids and triceps, and those muscle groups are certainly utilized in pressing and jerking. And the different angle hits all the muscles involved in a slightly different manner. 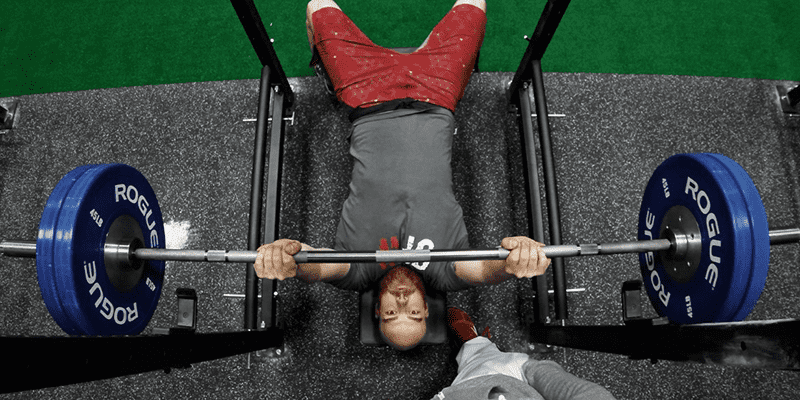 There are two things to keep in mind about the bench press in regards to Olympic lifters and other strength athletes who are concerned about their shoulder flexibility and not adding any additional weight to their chests. First, keep the reps low. Singles and doubles will strengthen the muscles involved without making them any bigger. Doing higher reps will tend to increase the size of the pecs, so if you don’t want that, stay with low reps.
Second, spend time stretching out your shoulders. Stretch them after every set, and do more after the session is over and even more later on that night. What it comes down to is the bench press is really no different from any other exercise in strength training. When it’s done with perfect technique and utilized in your program to meet your overall goals, it’s definitely a valuable asset.